The latest national survey by the Pew Research Center, conducted Dec. 3-7 among 1,507 adults, also finds a shift in attitudes about whether gun ownership in this country does more to protect people or put people’s safety at risk. Nearly six-in-ten Americans (57%) say gun ownership does more to protect people from becoming victims of crime, while 38% say it does more to endanger personal safety. 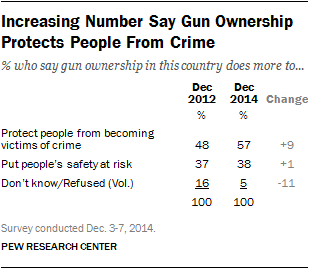 In the days after Newtown, 48% said guns do more to protect people and 37% said they placed people at risk. Over the past two years, blacks’ views on this measure have changed dramatically. Currently, 54% of blacks say gun ownership does more to protect people than endanger personal safety, nearly double the percentage saying this in December 2012 (29%). By contrast, whites’ views have shown less change: 62% now view guns as doing more to protect people, up from 54% in December. Partisan differences on this question, already sizeable in 2012, have widened over the last two years. 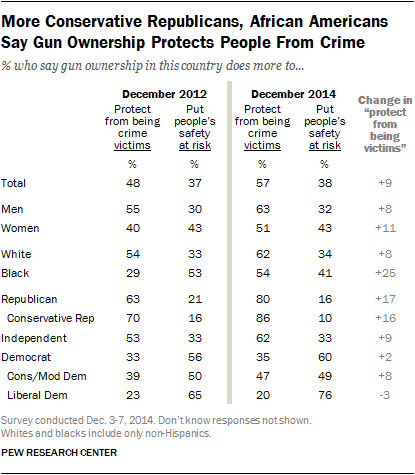 As was the case in December 2012, a majority of Democrats (60%) say guns do more to put people’s safety at risk, while only about a third (35%) say they do more to protect people from becoming crime victims. By contrast, eight-in-ten Republicans say guns do more to protect people from becoming crime victims, up 17-points from 2012. Across many demographic and political groups, opinion has moved in the direction of greater support for gun rights since January 2013, though the overall differences between demographic groups are largely unchanged. Today, about six-in-ten whites (61%) prioritize gun rights over gun control. By contrast, only about a third of blacks say this (34%) while six-in-ten (60%) say it is more important to control gun ownership. And Hispanics prioritize gun control over gun rights by a wide 71% to 25% margin. Among those who have not attended college, 53% say it is more important to protect gun rights. Those with graduate degrees continue to support controlling gun ownership at higher levels than those in other groups. As in the past, Republicans support protecting gun rights over controlling gun ownership by a substantial margin (76% to 22%), and support for protecting gun rights is particularly high among conservative Republicans (83%). Conversely, a majority of Democrats say that it is more important to control gun ownership (69%) than to protect the right of Americans to own guns (28%). Liberal Democrats, in particular, prioritize controlling gun ownership (81% say this, while just 14% say protecting gun rights is more important).